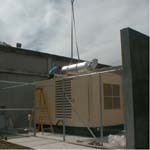 Generator installation and maintenance is another service we offer that has become critical in California . We’re experienced in surveying and installing generators such as this 1000 horsepower unit. In it’s first three months it has been automatically started several times due to loss of normal utility power.